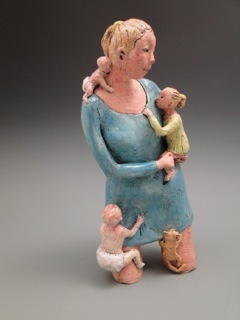 Linda Lewis loves to tell stories with clay because it connects us to one another and helps explain who we are. It eventually informed who she was as an artist and strengthened her desire to express common threads of the human experience by using the figure, imagery, and gesture as powerful narrative tools. Working with a material as simple as clay to create something as complex as a person is the perfect juxtaposition that allows her to create a world in which a story can unfold. Counterbalancing the sculptures are the titles with insightful and sometimes humorous cadences that support the narrative of each piece.